IC Insights has reported smartphones to account for 26% of the $30.0 billion NAND flash memory market in 2013. 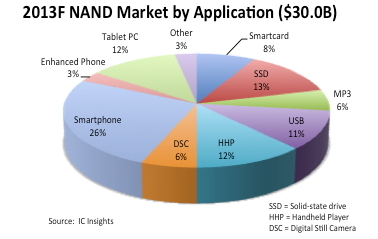 (The NAND flash market is forecast to grow 12% in 2013 from $26.8 billion in 2012). According to data from IC Insights’ 2013 IC Market Drivers Report, approximately 56% of total cellphone shipments in 2013 (975 million of 1,745 total shipments) are forecast to be smartphones, up from 750 million or 42% in 2012 and 30% in 2011. Another high-volume application for flash memory in 2013 as per IC Insights is solid-state drives, which are built with high-density NAND flash chips and feature standard mass-storage interfaces that are found on hard-disk drives. SSDs are forecast to account for 13% of NAND flash memory sales this year, as per IC Insights. IC Insights explains "SSDs are built in form-factor sizes that are identical to hard-disk drives (such as 1.8- and 2.5-inch modules) so they can be easily plugged into existing PC and notebook designs. In recent years, SSD-storage capacity has quadrupled annually, and now it appears that solid-state drives are becoming serious challengers to conventional hard-disk storage in portable computers. Recently, SSD-storage solutions have gained favor in large server computers, which stand to benefit from the faster read/write speeds of flash-memory-built drives as well as reduced power consumption. Notebook PCs, installed car navigation systems, industrial equipment, and digital video recorders (DVRs) are a few additional applications that are being targeted for SSDs." IC Insights estimates shipments of tablet PC devices like the iPad grew to 117 million units in 2012, almost double the 65 million shipped in 2011. IC Insights forecasts tablet PC shipments to reach 167 million units in 2013.